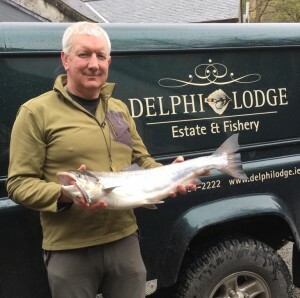 It’s ten years and ten days since Franz Josef Rothkotter and his son Nicklas first fished here at Delphi and on that occasion, it was young Nicklas who took the limelight, when he landed three Springers on his first day’s salmon fishing. They have both been a number of times since with Nicklas nearly always catching fish, but Franz Josef hadn’t been so lucky. That all changed today, when Franz Josef hooked and after 25 minutes landed a magnificent fish of 18lbs12ozs in the Rock Pool. The fish was taken on a fly that can only be described as a Conehead Cross between a Red Francis and a Monkey Dog, if that makes any sense! The fish was one of our own, as all wild fish are released and was more than likely a three sea winter fish. In other words, it would have been released as a smolt in late April 2016. 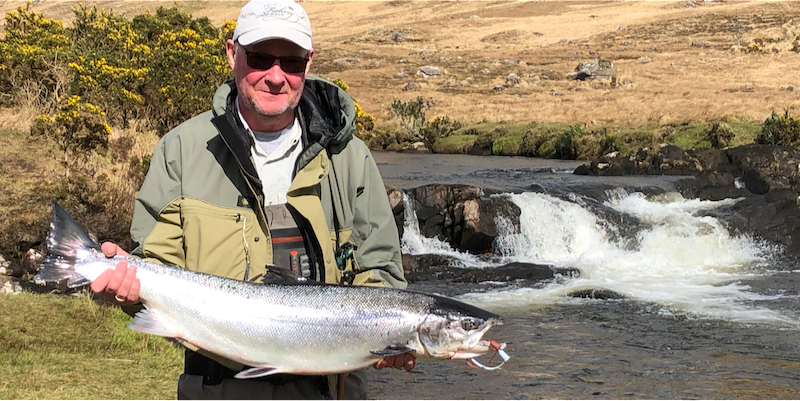 All I can say is congratulations to Franz Josef, on landing his first Delphi salmon and doing so in such great style, in conditions that can only be described as horrendous, with a northerly gale and temperatures of approximately 5 degrees and the river running at 25. We also had a fish yesterday when David Swaine one of our new syndicate members landed a cracker of 10lbs7ozs from the Quarry Pool on a Dee Sheep. Again, conditions were terrible, with a north westerly gale and showers of hail, sleet and snow, and the river was only at 15.